Joe Wilkins, Associate Professor of English, and Walter Wilkins, son of Joe Wilkins, reading Runaway Ralph, by Beverly Cleary, illustrated by Louis Darling. 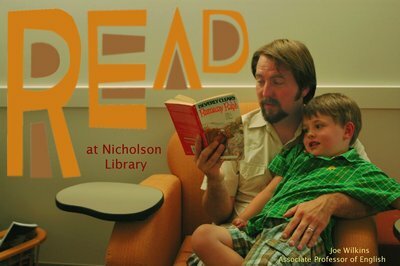 Terry, Paula and Nicholson Library Staff, "Joe and Walter Wilkins READ Poster" (2014). READ Poster Gallery. Image. Submission 142.